Home Biafra featured BIAFRA: IS THIS THE END OF BIAFRA RESTORATION PROJECT; TO QUIT OR TO CARRY ON? Let me kindly make it clear that the decisive time has come; had Ojukwu won the 1967 war, there would be no negative tales. The action of a man does not necessary matter; what matters is the result of his actions. Nnamdi Kanu is on a hard lane; everything he has done or will do does not matter; what matters is the result of this project that hit the shores of Nigeria in 2015. The simple term ‘the end justifies the means’ summed it all. Whether Nnamdi Kanu declares self-defense or allows his people die helplessly does not matter, what matters is the last-result of this project. He has done everything humanly possible to remain peaceful; but Nigeria brought war to him and his people. if he doesn’t want to defend his people and his life, then he must quit because the only way to carry on is self-defense and the best form of defense is attack. I have followed the Biafran populace and I learned something - they don’t care about what they lost or will lose, they only care about sovereignty. They have all got the share of the spoil; Nnamdi Kanu’s home was invaded, he was attacked and shot, he has disappeared like his people. Nobody will say Nnamdi Kanu is in the comfort of his home commanding or brainwashing; he is rather getting the bigger share of the spoil. The only thing that bothers me is - does Nnamdi Kanu really know the gravity of what he started? Last five years; I was a politician and good business man, I had started renovation of my family home and afterwards began building a new home, life was fair and everything simply moved on like a floating balloon. I had a little issue with my party- PDP and I decided to leave it for APC which was a new party then. APC needed members and as an experienced politicians and grass root ‘mobilizer’, I assumed the position of constituency youth chairman. Money comes in; business goes through but in 2015, things changed the moment I heard a voice over a radio station called Radio Biafra. I had pocketed One Hundred and Eighty Thousand Naira to deliver two polling-booths in my area and while I agonize losing the booths by eleven votes on House of Rep and waiting for the presidential poll in a beer parlor, my friend came in with a radio and from that moment I heard the voice screaming election boycott, I left my booth and ended my political ambition. The next few days; I was dreaming of how I would help the voice restore Biafra. Three years on; I am here today and seeing bloodbath; military occupation and molestation. The new house that was supposed to have been completed remained in lintel level till date. I dream nothing but Biafra; there is no hope except Biafra because I have reached a point of no return. My situation is applicable to millions of Biafrans and where will they go from here? Biafra has severed her political and economic relationship with Nigeria the more that coming back to Nigeria will be suicidal. There is no trust except suspicions everywhere; there can never be co-existence and neither will the military spare them (us). 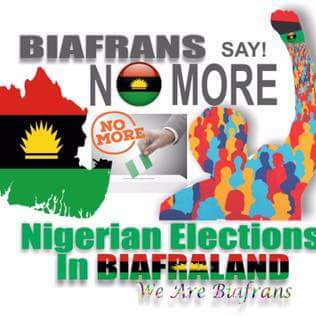 Nigeria will never conduct a referendum but would take the risk of murdering all outspoken Biafra activists. The Biafran political class will admit the situation because they have everything to gain- African politics is about enslaving the people with force of arm. The decision Nnamdi Kanu takes now does not matter; be it full blown war or pocket crisis, what the people want is for Biafra to be restored. Nnamdi Kanu must take a decision or ask the people to quit because peaceful agitation cannot be afforded on military-occupied Biafra land. Since the struggle for the restoration of Biafra championed by Nnamdi Kanu; the people of Biafra continued to be peaceful with hope that someday, international community will wade in and solve the problem. They have continued to take live bullets from Nigerian military; scramble to get video and picture evidences than defend their lives with hope that when taken to international community, their voices will be heard. How long will they continue to die before there is action and how long will they continue to video and snap their loved ones dying instead of saving their lives? Nigerian military now occupy Biafra land and has ordered the clamor for the restoration of Biafra to stop; the seriousness of the military followed the invasion of the home of the leader of Indigenous People of Biafra. The reality is that the people of Biafra have only one option; it is time to quit and go back home because peaceful agitation have no place in Nigeria. Most agitators have admitted to turn freedom fighting into political movements and that option is the only one left for non-violent group like IPOB unless they admit otherwise. 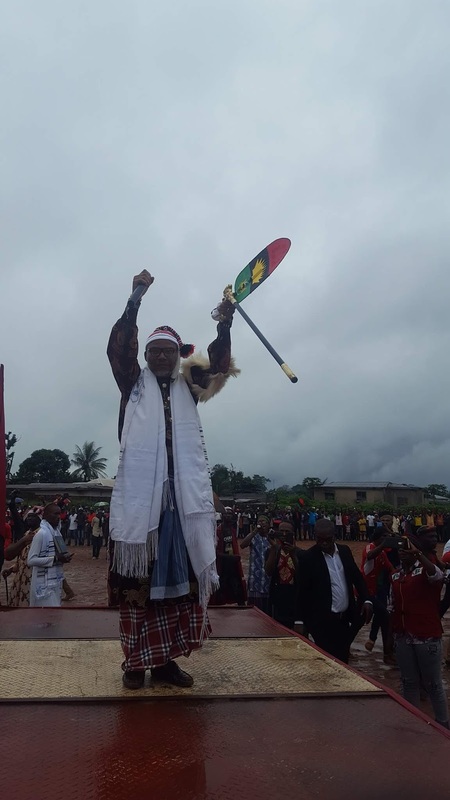 It was shocking that Nnamdi Kanu refused to quit Biafra agitation; his life is on the line and only armed agitation will save him if he ever refuses to retreat and surrender. But if Biafra agitation must continue; it would be by force of arm, the military occupation will soon start sweeping homes of prominent activists through the help of saboteurs and make sure that Biafra project dies by the force of arm. IPOB has said that they would vote to decide on self-defense; as I wait for the outcome, It would be disappointing if they vote to continue non-violently. The Biafra restoration project now seems to have hit the rock; the only way to keep going is self-defense on that same path of non-violence. If UN charter included self-defense, then it means peaceful agitation cannot implement self-determination. If the parent raises arms to kill peaceful agitators; peaceful agitators must devise a way to defend themselves and continue on the path of peace or nobody will remain to self-determine.